While it is just an accompaniment, a simple plain paratha is what makes completes an Indian meal. We often think of the curry as the hero of the meal, but it is the paratha that when used to scoop that curry, brings out the tastes and flavors of the curry. One day I was thinking “What is the most important part of my food? Is it the delicately spiced curry, vegetable fry or dal? Is it the potpourri of pickles and chutneys? What is it, whose absence will make my meal incomplete?” And the answer was a simple roti or paratha. In Indian cuisine, we don’t often celebrate our bread as much as we do our curries or biryanis. Paratha or roti is simply faded into the background as an essential accompaniment. But the truth is, no matter how good the subzi or the curry is, it is transformed into a great meal only when there is a good paratha or roti to eat with. I am attempting to bring the humble plain paratha into focus today. 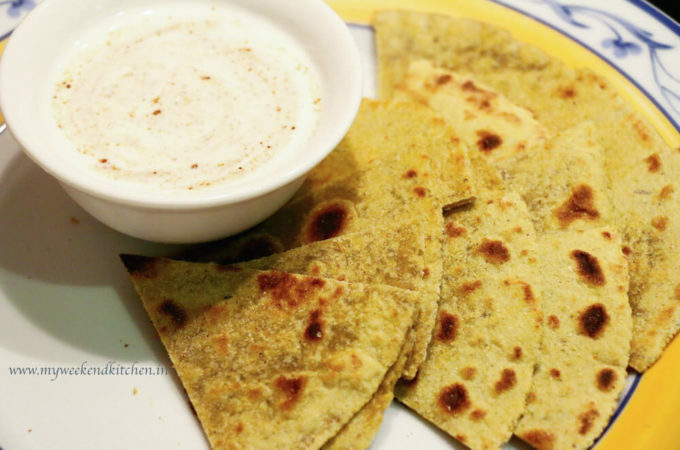 No fancy stuffing, no refined flour (maida) just simple, traditional and healthy whole-wheat paratha recipe, which can even turn a simple bowl of yogurt into a meal. A plain paratha if often sidelined in an Indian menu as being just an accompaniment. But the truth is, no matter how good the curry is, it is transformed into a great meal only when there is a good paratha or roti to eat it with. 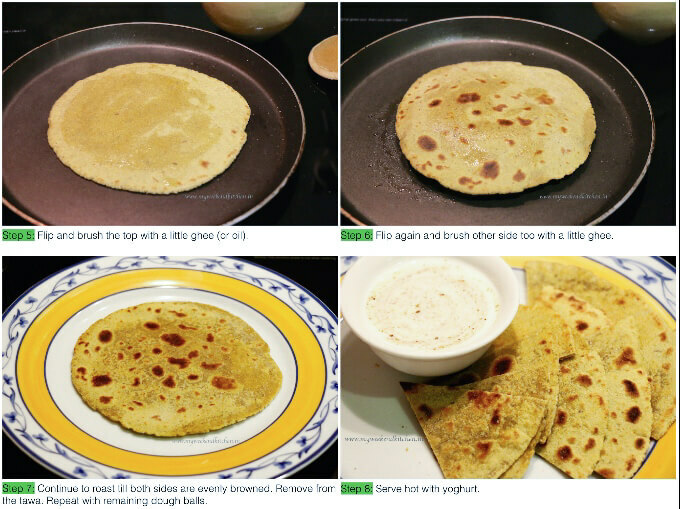 This is a step by step recipe (with pictures) for making the humble Indian bread called paratha. In a large mixing bowl, combine together the flour, salt, ajwain seeds, and red chili powder. Whisk the yogurt and add to the flour. Mix well with your hands. Add lukewarm water slowly to knead the flour into a soft dough. Cover with a damp cloth and keep aside for 15 minutes. After 15 minutes, knead the dough again for about 5 minutes. I have learned this from my grandma — the more you knead the dough, the softer your bread will be. So no shortcuts on this one! Divide the dough into 6-8 portions and make balls. 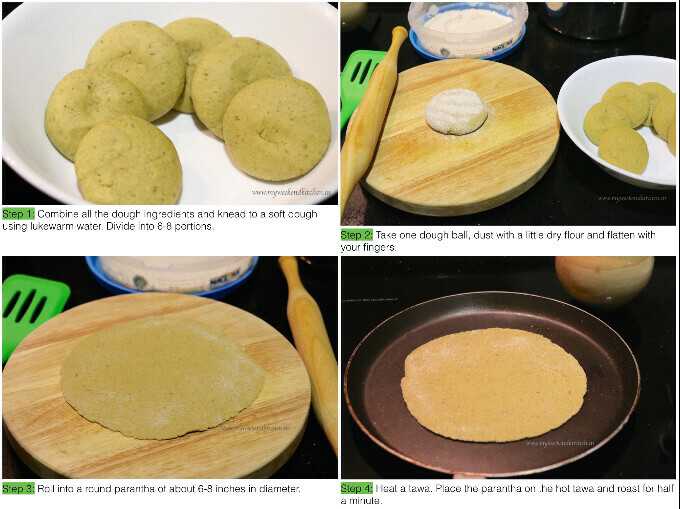 Dust one ball with some dry flour and roll out into a round paratha of about 6-8 inches in diameter. Heat a flat pan/tawa. Place the paratha on the hot tawa and roast for half a minute. Flip and brush the top with a little ghee (or oil). Flip again and brush the other side too with a little ghee. Continue to cook till both sides are evenly browned. Takes about 2-3 mins for each paratha. Repeat with remaining dough balls. Serve hot with yogurt spiced with a little red chili powder, cumin powder, and salt. 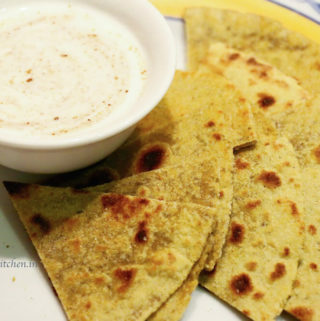 For variations in the plain paratha, you can knead different types of seeds and spices in the dough like cumin seeds, fennel seeds, and/or coriander seeds.